Custom built with your comfort in mind. Spacious guest suites with ensuite private bath featuring jetted tubs. Quiet dead-end street with mountain views and wooded setting. 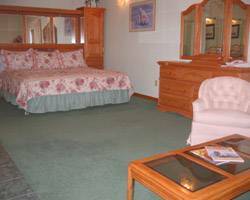 Amenities include gourmet breakfast, robes, phone, cable TV, clock radio and quality beds. Beverages available 24 hours. Late check-in. Laundry facilities. Airport transport available. Convenient location just minutes from downtown and airport. Near museums, hiking and biking trails, glacier and wildlife cruises, flightseeing, fishing, Botanical Gardens and dining. We welcome families and larger groups. Most suites have multiple beds and are very spacious. Handicap access. 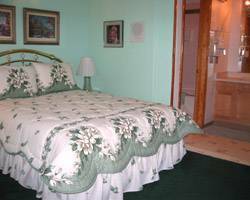 Amenities include private baths, jetted tubs, spacious suites, deck, gourmet breakfast, robes, phone, cable TV, clock radio and quality beds. Laundry facilities. Private guest kitchen. Airport transport available. Spacious suites that will accommodate larger families/parties. Most have multiple bed configurations. Ensuite bath with lavatory/vanity located outside of the bath area. Featuring jetted tubs. 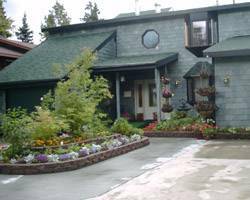 Situated on a bluff in a quiet residential neighborhood whever moose meander year round. Credit card guarantee with 14 day cancelation required without penalty. Payment due upon arrival. East on Tudor to Baxter, left to Campbell Airstrip, left to 38th to end of block at corner of 38th and Delwood Place. AK railroad to Denali National Park, Whittier, Seward, and Fairbanks.